June 17-19 marked round 3 of the NASA Northeast Racing season. We found ourselves back at New Jersey Motorsports Park racing at the Thunderbolt circuit. NASA NE might as well build a head quarters there since that's where 80% of the racing is this season. It's a track I enjoy very much and also where I got my first (and only) two race wins in October of last year. The AMT Motorsport C5Z was dropped off at 12:30am on Tuesday morning. That is indeed an odd hour to accept a race car but there was still lots of work to be done before the car could be loaded up Thursday afternoon to head down to NJMP. The car had a 4 stage ARE dry sump installed over the past several weeks that took longer than expected so we were behind the 8-ball. We missed the chance to test the car on Monday the 13th at Palmer Motorsports Park so it's maiden voyage would be a race weekend. 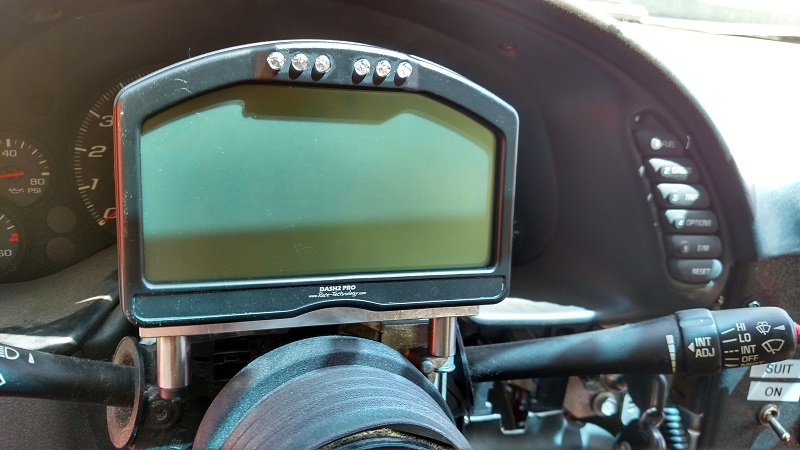 Tuesday was spent making billet brackets to hold the Race Tech Dash2Pro as well as a plate to hold the buttons to control it on the steering wheel. 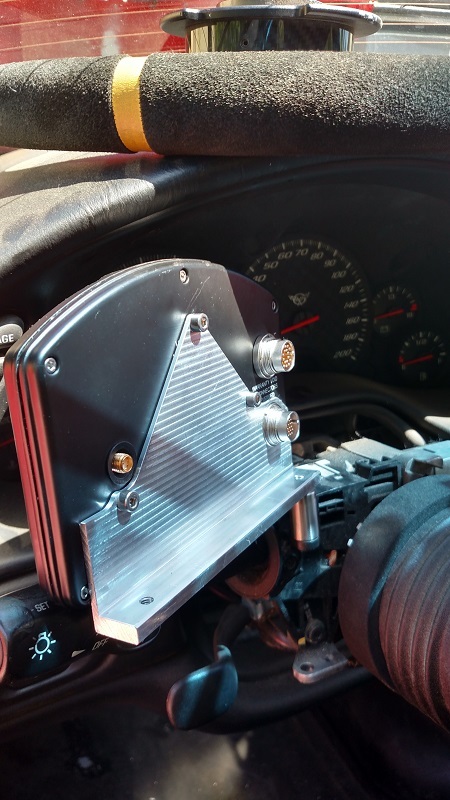 We came up with a real nice and easy mounting solution if you use a stock steering column in your C5 or C6. Most dash installs are custom jobs, but we have a plug and play solution going forward that we think anyone who installs a product like this would appreciate. Pictures attached of the work. These are prototypes - the finished product will sit lower so you can see the entire dash through the steering wheel. As it is the shift lights are not easily visible by the top of the wheel. Another 1/4'' lower or more and it will be perfect. 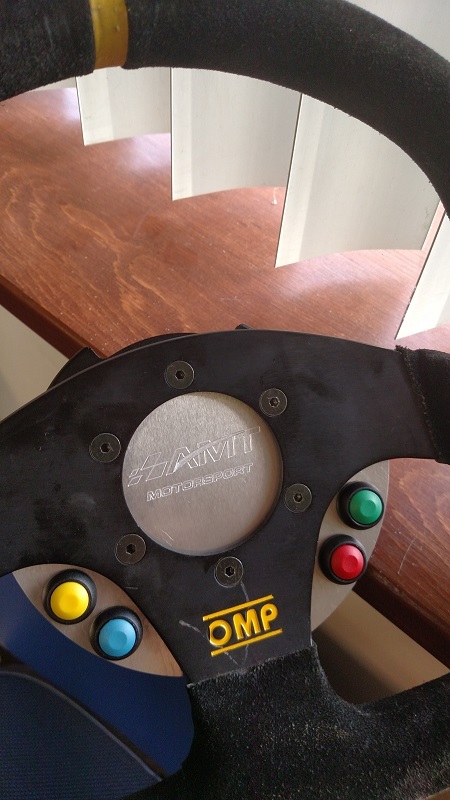 The steering wheel button plates will be available shortly as well. 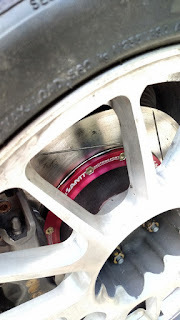 Second order of business was to install the AP Racing rear brakes on the car. The car is not terrible with the stock brake setup in the rear, but the AP kit allows for thicker pads that last much longer than stock pads. We can also use our AMT Motorsport full floating rotors for always-solid stopping power and rotors that will last seemingly forever. Big thick pads and big rotors also lead to confidence on the brakes, and coming three wide into turn 1 at 145mph you appreciate confidence. I'd hoped I'd never have to be worried about the rear brakes again, however testing on Friday would prove otherwise. Friday was a test and tune session where racers, TT'rs, and advanced HPDE drivers can get 2 hours of track time throughout the day to sort out the car. As per usual the Corvette had undergone yet another major change since the last time it was driven in anger, so the testing time was necessary. First order of business was to do 3 or 4 installation laps just to get the car warm and bed the brakes. There were dozens of fittings and lines added with the dry sump system so it's important to go through all of them and make sure nothing was leaking. No leaks were found, and the dry sump appeared to have done it's job in keeping oil out of the intake system, thusly eliminating the smoke screens we were laying down 2 months ago. Other major function of the dry sump is to keep a steady supply of oil running through the motor in all conditions (especially high G turns) where the standard sump might run out of oil and blow the motor. Also working as planned - so far so good. Second test session was run at something closer to race pace, with lap times in the 1:28-1:29 range. Car started out OK, but the brakes started to feel like poop early in the session. The car was engaging Ice Mode every time I hit the brakes. Essentially something was causing the ABS to freak out and rather than the car allowing ABS not to engage, it instead engages ABS way too early and the car stops like crap and the brake pedal feel is terrible. Data would show that in Ice Mode the car is only braking at 1G, where with my setup should easily be over 1.5Gs. Again losing 50% braking force is neither fast or confidence inspiring, so it was definitely cause for concern. We checked tire temps and while the temperature spread was good (meaning the setup on the car is correct) the left rear tire was way hot - over 220 degrees after a slow lap through the pits! We hadn't yet thought about the new left rear caliper being the cause of our issues, but time would tell. I drove my buddy Tony's BMW GTS2 car between my second and third sessions. Tony hadn't been to the track before and I was hoping I could set a faster lap so he could compare the data with his AIM MXL2 dash. The car was a peach to drive, and I ended up 3 seconds quicker than his previous best - a 1:34.something. Happy to report that Tony ended up in the 1:33s by the end of the weekend and came in third place in the Sunday race. Congrats Tony! Drove the third session of the day which went more or less the same as the second session - not so great. Brakes were still bad and there was smoke coming from hood when the car was slowed. Upon inspection we found the oil was coming from the left valve cover, which pointed to a bad valve cover gasket. The oil loss was not great, but of course it's dripping right onto the headers hence the smoke. Smoke from the hood of your car is also not confidence inspiring, so we put it on the trailer and would install a new valve cover gasket that night. Best time of the day was a 1:28.1. Not good enough, but not bad considering the brakes were crap and the track was much hotter and slicker than the last time we raced here in October. New suspension felt fantastic and all mid-corner speeds were higher than they've ever been, so the car (and driver) are definitely heading in the right direction. We started working on the car at AJ Hartman's shop just 10 minutes from the track. Valve cover gasket was an easier job than expected and was replaced in less than an hour. The remaining 8 hours was spent wiring in the fancy new Dash2Pro. My friend Ben Lesnak had offered to do the install because he's an awesome dude and because AMT has made him a couple simple parts for his own ridiculous ST2 Corvette. Hopefully his car will never actually be finished because when it is an amazing car with a great driver will be really (REALLY) hard to beat. Ben did a fantastic job wiring in the Dash using all pro-style materials and pro-style expertise. Unfortunately the process took a bit longer than expected but that happens when you aim for perfection. The Dash worked great, and I got to the hotel at 3:45 and set my alarm for 7:15. Lovely. After a 2.5 hour nap it was back to the track. We were met there by Tyler Cooke, pro driver for Bimmerworld and racing in the competitive ST Class in the Continental Tire Racing Series. Tyler was there to help extract every ounce of lap time the car and driver had available as well as provide tutelage on the radio in regard to race craft. Unfortunately Tyler was mending an injured wrist and not able to drive the car to set a flying lap to compare against. Fortunately his assistance on the radio would prove very important. Practice for the Thunder Race group was at 10am. To our chagrin the brakes were no better on Saturday than they were on Friday even though we changed pads in the hopes it would cure the braking woes. Additionally, the replaced valve cover gasket did not stop the small leak coming from the valve covers. Slightly better, but not fixed. We went out in a TT session to try and get more time out of the car and put to practice some of the pointers Tyler had given on finding more speed on the track. The car lasted only half a lap before smoke started billowing out of the engine bay and filling the cabin with smoke. Luckily this was not my first time experiencing such a thing, so I calmly poked my way back to the pits and brought it into the paddock to source the problem. Oil pressure was good throughout the ordeal so I was confident nothing catastrophic had happened. We popped the hood and the engine was covered in oil. We took a few things apart and found that a line from the oil cooler had sprung a leak and was squirting oil all over the place at a ridiculous rate. Think about a super-soaker squirt gun volume of oil spraying everywhere. Dejected by my constant bad luck during the weekend, I was ready to put the damn thing back on the trailer and go home. Again Tony Bodine came to the rescue. He wouldn't allow me to not try and at least fix the car. I know nothing about AN lines or how to deal with them, so I rode across the paddock to see Pat McMahon, fellow ST2 competitor, engine expert, and all around awesome dude. Pat lent us some tools, told us what needed to be done, and we were on our way. We disassembled the hose, cut the hose for a fresh seal to the AN fitting, slapped it back together, fired up the motor and we had fixed the leak. Again "we" is a loose term. Tony Bodine did all the real work on my car, at the expense of his own track time. He finished my car, and with a couple minutes to spare hopped in his car to go qualify for the GTS2 race. Unfortunately I had more work to do to finish the car and wasn't able to qualify. I'd be starting the race from the back of the grid. And not just from the back of my grid, but apparently from the back of the entire grid! Generally ST cars and GTS cars start in two different waves. I assumed I'd be starting from the back of the ST field, but ended up starting behind the GTS2 cars all the way back in 43rd place. Knowing I had no shot at the podium Tyler assured me this was going to be a fun race and I was going to learn a lot about race craft. He was absolutely correct. As the green flag dropped I quickly made up 5 or 6 spots before turn 1. One would hope so, since I have double the horsepower of most cars at this end of the grid. After turn 1 I went on a tear for the next 14 laps passing as many cars as I could and having a blast along the way. Most cars were easy to get by for the first half of the race due to the power difference. I then came up on higher horsepower cars from my own field, and passes on these vehicles needed to be made under braking or by being a bit brave through the high speed turns. I had one particularly good 3 lap battle with an out-of-class ST1 Corvette with probably 75 more horsepower than my car. He was fast in the straights but parking it in the turns (like most Corvette drivers). Tyler watched this battle unfold and was feeding me tips over the radio. Eventually I was able to get a run on him out of the Octopus where I'm flat on the power through the very fast turn 12 and some perhaps less-brave folks are not. I got about a foot off the ST1 Corvette's bumper, rode it all the way down the straight, and despite my miserable braking performance got him under braking into turn 1. I shouted to Tyler over the radio and went after the next cars in sight. Unfortunately on Lap 14 two very fast SU cars (Super Unlimited - meaning no power to weight restrictions) came together on the front straight about 5 seconds in front of me. I saw a plume of dust coming from the track and originally thought nothing of it. I quickly realized at about 130 mph that there were two stricken cars sitting in the middle of the track as well as a slew of parts that had been scattered in the wreck. I slowed the car in a hurry and diced between the two cars and their various parts, only to find the race had been Red Flagged before I made it to turn 1. Rightfully so - it was a massive wreck that took time to clear and the medical staff needed to make sure both drivers were OK (they were, thankfully). By the time the dust settled I'd made it up to 12th place overall, 6th out of 7 in my class, and made 28 passes earning me Hard Charger award for the race. Would I rather have been battling for 1st instead of 6th? Absolutely. But the race was an absolute blast and I made more passes in one race then some cars make in a season. With Tyler coaching me on the radio I received a master class on race craft in 30 minutes. Earlier I used the word "luck." There's a not a ton of luck in racing. You do the work, you prepare the car, you practice your driving and your technique and THEN (with maybe just a dash of luck) you can win races. I was in no position to come away with wins this weekend with an untested car that had undergone major surgery. Unfortunately time ran out and we weren't able to put the car through it's paces before it came time to race. Things didn't break because we were unlucky they broke because we hadn't prepared. A lot of learning was done this weekend and we'll be back stronger for the next race. So besides a not so great weekend the car ultimately held together, we have a great base going forward, and the data showed that once again, with the car running properly I absolutely have the pace to run at the winning end of the pack. We'll see if we can put it all together for the next NASA race at Palmer Motorsports Park in July. Follow AMT Motorsport by E-mail!